A Steed is not only a fine vehicle in «Guns and Magic» world and a good bonus to your characteristics, but also a loyal friend. This Steed window has 4 tabs: Training, Appearance, Merge, Beast Spirit. Button “Saddle/Rest” allows you to ride Steed or you can walk by foot. You can make your steed stronger with training. Depends on what type of training was chosen you can receive some experience for your steed, and also there can be a jump in development, for example, if the player uses training for dimes, then the Steed will receive 10 experience, and also there is a chance of small jump (experience x10). Be careful during the training for steed improvement stones! After the quantity of steed improvement stones becomes 0, you'll have to spend gold and coupons. 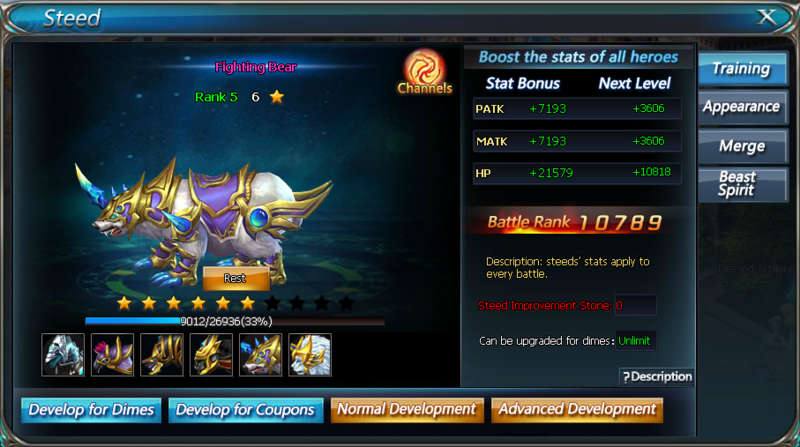 When your steed gets 10 stars of development it changes its rank and appearance. Steed's Sinews give bonuses to characteristics of channels. Blood crystals allow to improve channels, crystals can be received during special events. 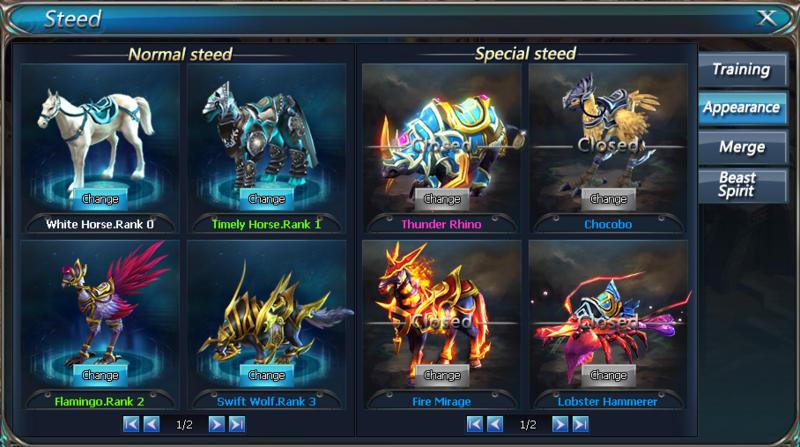 At any time you can change your steed's appearance (when steed reached certain rank). Steeds can be normal and special. Appearance of normal steeds will be available in process of receiving new ranks. Special ones can be received by taking part in different events or having satisfied a necessary condition. Changing the appearance of your steed doesn't change its characteristics which it adds to your hero. This function gives additional bonuses to characteristics of Steed, when certain conditions are satisfied. 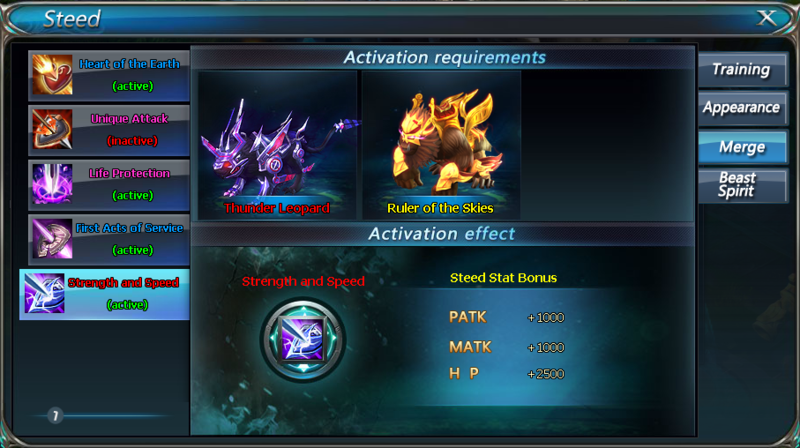 For example, if you have Thunder Leopard and Ruler of the Skies steed stat bonus to Strength and Speed is activated. Use Beast Spirit stones to upgrade characteristics of your Steed. 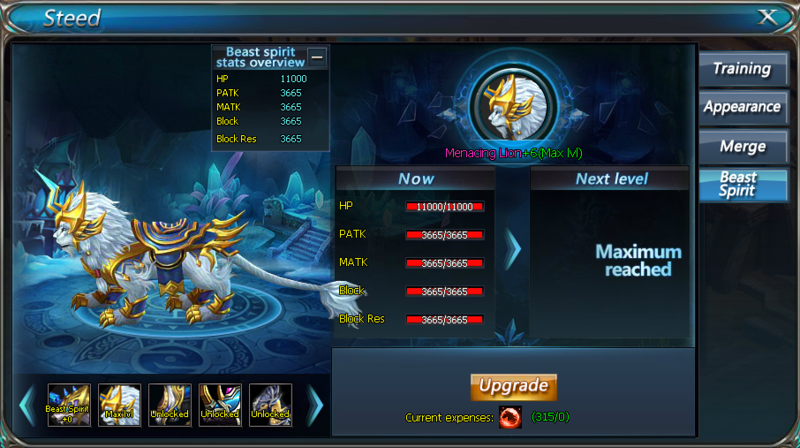 It also gives bonuses to your Battle Rank.